Beautifully decorated, this urn is available in two sizes for larger dogs and in a smaller size for cats and small breed dogs. 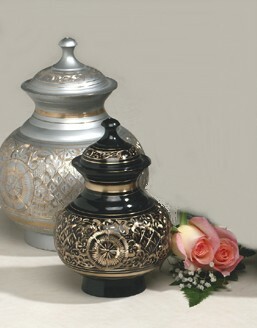 Made of solid brass with your choice of either a black or silver enameled finish. Surface is not engravable. Closure: Top-opening Threaded Lid 5.25" Dia. x 7.375" 90 cu. in. Urn Weight: 2.75 lbs.